The National Register of Historic Places is the list of individual buildings, sites, structures, objects, and districts deemed important in American history, culture, architecture, or archaeology. It is a federal designation and is administered by the National Park Service through the Massachusetts Historical Commission. Listing in the National Register recognizes that a building or group of buildings is important to the history of the community, the state, or the nation. Listing in the National Register of Historic Places does not place any restrictions on an owner’s handling of a property. National Register designation allows the owners of income-producing properties certain state and federal tax incentives for rehabilitation and provides limited protection from adverse effects by federal or state involved programs. 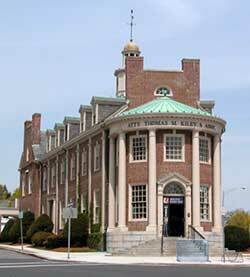 There are over 900 National Register Districts in Massachusetts, including seven in Andover. 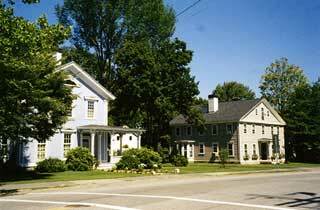 Thirty-nine buildings in Andover have individual National Register designations. “Situated on a hill somewhat removed from the town,” the Academy Hill are has often been likened to “a small village within itself.” Academy Hill includes three separate educational institutions with their associate residential buildings. Unusually dynamic and influential, the schools have played an integral part in American educational history as well as in town development, and they display an outstanding collection of architecture. Phillips Academy (1778) and Abbot Academy (1829) were established as independent residential secondary schools. These were supplemented by the Andover Theological Seminary (1807), founded for the theological training of ministers. Among the notable persons who have inhabited these celebrated institutions over the years are Oliver Wendell Holmes, Samuel F.B. Morse, Professor Austin Phelps and his daughter Elizabeth Stuart Phelps, Harriet Beecher Stowe, Horatio Greenough, William Henry Moody, Samuel F. Smith, Theodore D. Weld, Dr. Benjamin Spock, Ring Lardner, Jr. and several past presidents of major colleges and universities. Today the Academy campus encloses 450 acres and 160 buildings, including student and faculty houses as well as institutional buildings. It represents a blend of architectural styles – Georgian, Federal, Victorian, Colonial Revival and modern, spanning the full 200 years of the schools existence. The Academy Hill experienced two major periods of growth, the first, circa 1810–1835 and the second circa 1900–1935; (the latter involved not only new construction by also major landscaping and relocation). Charles Bulfinch, Guy Lowell, Charles Platt and Benjamin Thompson are several of the distinguished architects who have contributed to the development of this complex. Foxcroft Hall (1808), Pearson Hall (1818) and Bartlet Hall(1820) are the original Seminary buildings, all the Federal style. Although details vary between the three, the buildings harmonize in form (3 stories with hip roof), material (brick with sandstone or granite trim and general design (simple rhythmic facades with wooden cornices; two symmetrical entrances with fanlights and recessed doorways. Foxcroft Hall is the oldest extant school building in the district, a gift to the Seminary of Phoebe Foxcroft Phillips, wife of the founder. Rectangular granite lintels accent the very simple design. Pearson Hall, named for Eliphalet Pearson, the first principal, was the center of Seminary life, containing the chapel, the library and classrooms. When in 1922 it was moved to its present site, an 1875 Victorian tower was removed and its authentic Bulfinch exterior restored. The Victorian drip stops remain on the arched first floor windows, but the upper stories have splayed lintels. The doorways have sandstone columns and entablatures. Bartlet Hall, a gift to the Seminary of William Bartlet, was gutted by fire in 1914, then restored. Its fourth story along with that of neighboring Foxcroft Hal was removed in 1929 to make these two dormitories harmonious with the surround buildings in the Great Quadrangle. Notable details include the splayed window lintels and simple pier-and-lintel doorways, all in sandstone. Phelps House (1809), was given to the Seminary by William Bartlet, a merchant of Newburyport, as a residence for Dr. Ebenezer Porter, the first president of the Seminary. It was later the home of Seminary Professor Austin Phelps. One of Andover’s finest Federal style buildings, Phelps House is two stories high with an elegantly balustraded hip roof. The building’s faÃ§ade is its more exceptional feature, with flushboarding, relieving arches framing the first floor’s recessed windows and a center entrance portico surmounted by a Palladian window. Bulfinch Hall (1819), was the third Academy building. In those days the Academy, apart from faculty homes, consisted of a single building which was always called the Academy building. Bulfinch, though not the architect, was certainly the influence behind the design. The T-shaped building is two stories high with a hip roof and pedimented center pavillion. The first floor has rectangular windows with granite sills and lintels; second story windows are arched. The small center doorway is recessed, with granite columns and entablature and of course a fanlight. Samaritan House (1824) was moved to its present location to make way for Cochran Chapel in 1929. Originally an infirmary for Seminary students, it was later the residence of Principals Cecil F. P. Bancroft and Alfred E. Stearns. The three story cubical structure is built of clapboard with a hip roof. It is most notable architecturally for its gracefully detailed semi-circular portico and second story arched window. Stowe House (1828) was originally the place where theological students took their exercise…in making coffins. In 1852, Harriet Beecher Stowe had it remodeled as a residence for herself and her husband, Professor Calvin E. Stowe of the Andover Theological Seminary. With the addition of a large wing in 1888, the house became the Phillips Inn. In 1930, the wing was demolished and the house was moved to Bartlett Street. The building is 2½ stories with a gambrel roof, 7-bay faÃ§ade and pedimented center entrance. It is of coursed ashlar with granite window sills. Double Brick House (1829) was constructed for the music master and was later the home of Principal Samuel Taylor and headmaster Dr. Bancroft. The duplex is an interesting transitional design, combining the traditional gable roof, 3-story form and center entrance with the strong Greek Revival influence of rectangular granite lintels and classically severe recessed doorways. Graves Hall (first section completed 1882, completed 1892) was the science building until the construction of Samuel F.B. Morse Hall in 1928. An eclectic mixture of Romanesque and Queen Anne motifs, this 2½ story brick building is highlighted by its decorative brickwork and the heavy detailing of its Romanesque entry arch and recessed balcony. America House (1825, remodeled 1880s) was originally a boarding house. Here Samuel F. Smith, as a student at the Andover Theological Seminary in 1832, wrote My Country, ’Tis of Thee. The building has been used as a dormitory by Phillips Academy since 1919. The 2½ story clapboard structure retains its original 5-bay faÃ§ade, center entrance and cornice molding, but after a fire the present mansard roof, double doorway and Italianate porch were added. The following five buildings date from the Georgian Revival period of the early 20th century. Designed to harmonize with the early Academy buildings, these structures repeat essential motifs, but their much grander scale reflects expanded needs and technologies. The Archeological Building (1901), gift of Robert S. Peabody) was placed on the site of the original school building. In 1901, Peabody gave the Academy his collection of over 40,000 archeological specimens, this building in which to house them and an endowment for their proper care. The 2-story brick building has a hip roof and pedimented center pavilion, accented by corner quoins, arched windows and a full entablature. The Memorial Bell Tower (1923, Academy architect Guy Lowell) was constructed in memory of Phillips Academy graduates who had died in World War I. The granite base is surmounted by a brick shaft and wooden bell tower. The structure stands on land once used as a military training ground. Samuel F.B. Morse Hall (1928, Academy architect Guy Lowell) was named for the inventor of the telegraph and the Morse Code who was an 1806 graduate of the school. Built of brick with sandstone trim, the design loosely interprets neighboring Pearson, Bartlet and Foxcroft Halls in form and detail. Addison Gallery of American Art (1930, architect Charles A. Platt) exhibits a significant collection of paintings, including works by Winslow Homer, Edward Hopper and Thomas Eakins. The brick building is 2 stories high with a hip roof; its pedimented center entrance has 2-story Doric columns and a fanlighted door. Cochran Chapel (1932, architect Charles A Platt) is a superb example of Neo-Georgian architecture and is the center for the school’s religious life. The brick structure has arched windows and doorways, a pedimented pavilion with Doric columns and a towering Wren-esque steeple. Chapel Cemetery. The land here was deeded to the trustees of the Andover Theological Seminary in 1820. It has served not only professors of the Seminary, their families and a few early students, but also friends, faculty and families of the Academy. Harriet Beecher Stowe, married to a Seminary professor and Andover manufacturer, John Dove are buried here. Like Phillips Academy and the Seminary, Abbot Academy had a clearly defined center of campus, called the “Abbot Circle.” Formed by Draper Hall, Abbot Hall and McKeen Hall, the Circle was the focus of special occasions such as Commencement processions, winding the Maypole, Phillips serenades and the Centennial in 1929. Abbot Hall (1829). The original Academy building was erected facing School Street. In 1888 it was moved to its present site and fifteen years later was remodeled into a science building. In 1905, it was rebuilt to contain a chapel, an observatory, an art gallery, a larger assembly hall and the science laboratories. The most imposing of the district’s early buildings, Abbot Hall is Neo-Classical in style, highlighted by a 2-story center pavilion with Ionic columns. Draper Hall (1890, Hartwell and Richardson, architects) was built as a dormitory — “not only a much needed and valuable addition, but an ornament to the town.” The 3½ story brick building with terra cotta trim is in the Richardsonian Romanesque style, with Shingle style influences. The composition is symmetrical but flowing, its large gambrel roof enclosing a center cross-gable, shingled cross-gambrels, cylindrical towers, arched openings and decorative brick work. Merrill Memorial Gateway (completed 19212; McKim, Mead & White, architects) was donated by over three hundred alumnae in memory of Maria Stockbridge Merrill, head of the French Department 1878–1907. The tri-partite gateway consists of simple brick piers with pineapple finials and abundantly scrolled metalwork. The Grove is a wooded area behind the old Abbot campus where girls could seek quiet and seclusion for contemplation. Formerly there were paths, benches and a Garden Remembrance in the Grove, which was also know as Temperance Woods because the Women’s Christian Temperance Union held outings there in the 1870s. The complex of industrial structures and associated buildings lies at the heart of Andover, an area traditionally known as “The Village” in recognition of its central role in the town’s existence. Factories and residences cluster around two waterfalls on the Shawsheen River, and the District reflects the concentration of population around such power sites after the advent of the region’s industrial era. The growing number of residents here led to the establishment of Andover as a separate entity from the original agricultural settlement now known as North Andover. On a broader scale, the District represents a significant site of early industrial activity in the Merrimack Valley. A variety of early mills, including an iron-works, a Revolutionary War powder mill and a paper mill operated here in the 18th century, but left no visible remains. Textile operations, which would for many years form the basis for the area’s development, began early in the 19th century. Cotton spinning and woolen manufactures were followed by the country’s first flax factory. Surviving factory buildings and housing related to these early enterprises plan an irreplaceable role in the historic fabric of the community. The Andover Village Industrial District contains three distinct subsections based on different manufactures; geographical proximity, economic ties, and architectural similarities form the common theme. The industrial buildings in this area are typically 2 to 4 stories of brick, have plan designs and are strategically placed in dense clusters. The residential areas connected with the factories are small in scale and limited in stylistic ambition. Simple shapes and a very restrained use of ornamentation characterize the district’s housing, most of which dates from 1820 to 1910. Marland Mills. The oldest surviving building of the Marland Woolen Mills, 15 Stevens Street, is the woolen mill (ca.1820–1830) which is located on the west side of the Shawsheen just downstream from the dam. The original Greek Revival structure has granite sills and lintels and tied-in walls. Three stories survive, the pitched roof and fourth story having been removed around 1910 and a fourth story with a flat roof added. To the west, along Stevens Street, stand the two most visible structures in this complex. An 1883 spinning and carding mill (with a fourth story added in 1925) is distinguished by segmentally arched windows, ornate brick corbelling and a five story bell tower; a four story weaving mill built in 1925 has a distinctive saw-toothed roof. Other prominent structures at this complex included a two-story picker house built in 1850 and a two-story finishing-spinning mill of 1864, on the east side of the river. Various additions from 1925–40 obscure some of the smaller, older buildings. Early mill housing in the Greek Revival style stretches up from the mills on Stevens (originally Marland) Street. Two brick duplexes, 55–57 and 59–61 Stevens Street, (circa 1820s) are 1½ and 2½ stories respectively, with granite sills and lintels. The refined simplicity of these two houses is remarkably similar to the functional design of the 1820s mill building. A row of somewhat later tenement housing (circa 1830–1850) built in wood stands at 188–222 North Main Street. The harmonious streetscape is comprised of two 1½ story cottages with distinctive Greek Revival doorways (razed 2004) and four 2½ story, multi–family houses with little stylistic ornamentation. Broad facades, uniform setback and spacing and original window sashes highlight this group. No. 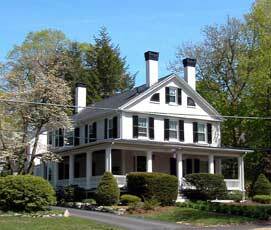 29–33 Shawsheen Road was built has the home of founder Abraham Marland in 1813, located about a quarter mile upstream from his mill. This simple but gracefully proportioned Federal style house is two stories high with a hip roof, 5-bay faÃ§ade and pedimented center vestibule. At 232 North Main Street is the house built circa 1828–1830 for Parker Richardson, a machinist and partner in the firm of Gilbert and Richardson, which became more famous later in North Andover as Davis & Furber Machine Co. Similar in form and design to the Abraham Marland house but built in sturdy brick, this building was later occupied by William Sykes Marland (a son of Abraham Marland) and by Nathan Frye, both of who were prominent in the administration of the Marland Mills. The Abbot Village site has been historically important since 1807, when Marland erected a cotton mill here, but it has been dominated by Smith & Dove since 1843, when that company moved its linen manufacturing from Frye Village. Today a single textile business is still operating here, the Redman Card Clothing Company. 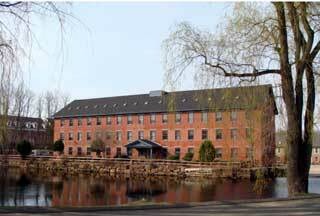 Adjoining the Abbot Mill, on both sides of the Shawsheen River, are the mill buildings of Smith & Dove. On the east side of the Shawsheen is a stone mill built in 1824; its original third story with a clerestory monitor roof has been removed and two stories of brick added. A series of brick storehouses circa 1850–1860 have also been greatly altered and remaining buildings sate from 1890–1925. Significant early housing associated with the Abbot Village complex includes 51 Red Spring Road (circa 1820–1830); a vernacular, Federal style frame building which has been boldly remodeled with Italianate brackets and window trim, 29 Cuba Street (circa 1830–50); a 2½ story Greek Revival building of granite ashlar with a traditional center doorway and numerous Federal period houses along Essex Street and at the junction of Shawsheen and Red Spring Roads. Later housing is represented by such structures as the three very simple Italianate boarding houses at 38–48 Red Spring Road (circa 1890), the identical gambrel roof duplexes on Brechin Terrace (1890s) and the attractive Colonial Revival apartment house at 70–84 Essex Street (circa 1900–10). Separating the Marland Mills and Abbot Village but connecting both with the downtown area is a stone arch bridge (circa 1820), built of uncoursed stone rubble set without mortar. The third complex in this district is unrelated to textiles. The Tyer Rubber Company, 30 Railroad Street, was established in 1856 for the manufacture of rubber cement. The business expanded rapidly to include a wide range of small rubber items, but its major product was rubber footwear. The present 4-story, brick building with its distinctive end towers was erected in 1912; it was designed by Charles Main according to standard mill construction principles of the time. A boiler and engine house and two other small buildings, all in brick, complete the group. No residential structures are directly associated with this factory. The Ballardvale Manufacturing Company was established in 1836 by John and William S. Marland in association with several other investors. The Marlands named the village after Timothy Ballard, who had operated a grist and saw mill here and built a new, 200 foot long dam here in 1835. The Ballardvale mills produced world renowned worsted goods, flannels, and delaines and at one time experimented with silk manufacturing. John Marland, the principal force behind the development of Ballardvale, had extensive plans which were realized in the Ballard Vale Machine Shop Company (1848, manufacturing locomotives), the Whipple File Company (1860, the world’s first firm to make machine-cut files successfully), the Abbot Hat Factory, Craighead and Kintz Company (1883, “art” metalwork-lamps, plaques and figures), and the Willard Pottery (1880, stoneware). These companies flourished through the 19th and early 20th centuries. Only the mill buildings are standing today. In addition to the mills and factories, Ballardvale in its prime (circa 1835–1935) contained a multitude of commercial activities; a railroad depot, post office, millinery shop, shoe shops, pool room, barber shop, bowling alley, tailor, blacksmith, tavern, and numerous general stores. Several churches, a school and an entertainment hall contributed to the cultural life of area residents. The early employees of the factories were skilled Scottish, English and Irish craftsmen. Fifty acres of land owned by John Marland in the heart of the village were laid out into house lots in 1848 and were very quickly developed. Originally company owned, many of the residential properties were soon bought by their prospering tenants. The buildings are typically small and simple, in the Greek, Gothic and early Italianate styles. Many were built by Jacob Chickering. The remarkable variety of designs in Ballardvale is tempered by a conservative demeanor, harmonized by judiciously placed building sites and distinguished by a careful use of detail. Railroad Depot, 174–176 Andover Street, (circa 1845–48). This Italianate structure bears a curiously picturesque elegance. Vigorously decorated, it boasts widely over-hanging eaves, a center doorway on each long side with transom and bracketed cornice, and gable ends with elaborate, multifarious window openings. Built as the second depot and the post office for the Ballardvale community, the building was at one time also used for religious services and entertainment. In 1950 it was moved northwest from its original site and turned 90 degrees. Ballardvale Community Center, 179 Andover Street, (circa 1843–48). The formal T-plan of this Italianate building contains 2½ stories. Simply but forcefully detailed, the structure is distinguished by its strong, well-balanced motifs. Built as a school house, it became a branch library in 1913 and was more recently used as a library and community center. (Demolished by the Town in 1981). 189 Andover Street, (circa 1830) is a Federal style duplex of 2½ stories. The 6-bay faÃ§ade has a center entrance, remodeled of the Queen Anne period. Over looking the mill pond, this is a good example of the earliest housing in the district. 6–8 Dale Street (circa 1843–48) is a Greek Revival style duplex with classical center entrances. Its brick construction features wood window sills and lintels; the gable slate roof runs parallel to the street. One of the first mill houses in Ballardvale, the building has a simple but refined design. 21 Tewksbury Street, (circa 1843–48), is a Greek Revival cottage of 1½ stories, gable end to the street. The side hall plan has a classical offset doorway and pedimented lintels top the windows. This is a more fashionable scheme than the duplex above, although the striking detailing of the openings is still not confidently handled. 8 Marland Street (circa 1848–52) is a Greek Revival cottage of 1½ stories, gable end to the street. It is of brick construction with granite lintels and sills on doors and windows. The side hall plan has an offset doorway with bracketed hood and double doors; a dogtooth course runs under the eaves. This is a solid, well-conceived design which comfortably combines varying motifs. 13–15 Tewksbury Street (circa 1843–48) is another Greek Revival duplex with center entrances. This substantial building has a conservative 6-bay faÃ§ade of 2½ stories, able parallel to the street. Strong detailing includes corner pilasters with entablature, wide window lintels, doorways with transoms and sidelights and round-arched windows in the gables. 32–34 Center Street (circa 1843–48) is a large Greek Revival duplex of 2½ stories, able parallel to the street. The 6-bay faÃ§ade has sidelighted center doorways and pedimented window lintels. The decorative trim is simple yet noteworthy on this early example of a factory owned tenement, marked on an 1848 map as Ballardvale Machine Shop Block No. 3. 36–40 Center Street (circa 1860). This four family house in the Italianate style has 2½ stories, gable parallel to the street. A plainer design than its neighbor above, the building is noteworthy for its broad, 8-bay faÃ§ade and narrow corner pilasters. 51 Center Street (circa 1843–48) is a Gothic Revival duplex with center entrances. The 1½ story cottage has a bold faÃ§ade with three cross-gables, classical paired doorways and corner pilasters. These dynamic motifs are contrasted by an ambitious but hesitant pedimentation of the center gable windows. 60 Center Street (circa 18852–72). This plain, 6 family tenement has only 1½ stories, gable parallel to the street. The building is an interesting example of later mill housing, unusual in its lack of ornamentation. High Vale Lane, 10, 12, 14, 20, (three houses, circa 1843–48; church 1883). One of Ballardvale’s most attractive streetscapes, this portion of High Vale Lane (formerly High Street) contains three houses and a church. The houses are each in a different style, Greek Revival, Italian Villa and Gothic Revival – displaying the careful and yet vernacular design so distinctive to the district. 19th century owners of these houses tended not to be factory workers, but rather independent businessmen; one was a dealer in coal, wood, hay and ice; another owned a dry good and grocery business. St. Joseph’s Chapel (Roman Catholic) is a picturesque Gothic church with small corner spires and lancet windows. Marland–Bradlee House, 228 Andover Street (circa 1843–48) This impressive Italianate mansion is 3 stories high in its main part, with smaller appendages at the rear. Flushboard siding, paired eaves brackets and prominently molded window trim articulate the walls. The faÃ§ade is highlighted by an extraordinary semi-circular bay window on the ground floor; entrance to the house is through a side porch and a double doorway. Built as the mansion house of John Marland, later purchased and occupied as a country home by Capt. Josiah Putnam Bradlee, sole proprietor of the Ballardvale Company after 1866. Central Street marks the confluence of the main roads to the North Parish, Boston, Salem and Haverhill. The physical and psychological advantages of such a location were recognized quite early. In 1709 the first South Parish meeting house was built near the site of the present South Church. Substantial residential building soon followed and lasted through two centuries. The 19th century introduced an extraordinary diversity to the Central Street District. Three religious focal points were added. 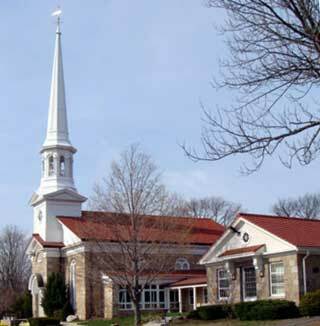 Andover Baptist Church was built in 1834 in the Greek Revival Style by Andover’s Jacob Chickering. It was the first Baptist Church in Andover. The brick building is severely plain with its temple from relieved only by an incongruous, traditional steeple. T.A. Holt and others operated stores in the church’s basement from 1834 through the early 20th century. Parishioners of South Church (Congregational) worship today in their third meeting house built in the Romanesque Revival style in 1861 by architect John Stevens of Boston. Unlike most structures in this style, South Church was built of wood. The building is further distinguished by its buttresses, arcaded corbel tables and the central tower with a unique domed steeple. 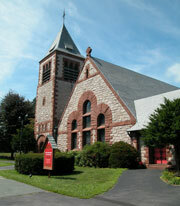 The Episcopal Church, (Christ Church) was established in Andover in 1835. The present structure on Central Street is an 1882 Hartwell and Richardson design. It is one of the finest examples of Richardsonian Romanesque churches in the region. The asymmetrical, polychrome mass is built of random ashlar with sandstone trim. The style’s typical largeness and simplicity of form are here evident in the gabled nave, low apse, square corner tower and heavy arched openings. The increased prosperity of the late 19th century heightened the demand for high quality houses in this area. The Smith–Purdon House at 65 Central Street was built in 1874 by B. Frank Smith, whose father had founded the Smith and Dove Mills.The delicate Italianate structure as a flushboard faÃ§ade with a central pavilion, elaborate wall and window cornices and unusually attenuated proportions. It is complemented by the original carriage house. Next door at 67 Central Street is the country home of Jacob Farnum Carlton, constructed circa 1857 by local architect/builder William Stuart Jenkins. Carlton, an Andover native, owned and operated the United States Hotel in New York City. His house is a similar blend of sophistication and vernacularism, with its striking 5-bay faÃ§ade pf Gothic arched windows. A few staid Italianate and Mansard style mansions were interspersed in the forth quarter of the 19th century. Representative of these is the home of Rev. Ã‡.L. Mills, 66 Central Street, built circa 1872–84. The heavy design contains quioned end pavilions and elaborate cornices under the original slates of a hipped roof. By the turn of this century, development was essentially complete, ending with the well developed Shingle Style of the Belnap House (1890) at 71 Central Street. From beginning to end, chronologically and topographically, Central Street contains an extraordinary diversity of buildings in an harmonious progression of styles and forms. Main Street – Locke Street is one of Andover’s most visually pleasing residential districts. Architecturally heterogeneous,the area maintains an harmonious rhythm of siting, landscaping and general form. Functions and uses of the properties have changed during the past two and one half centuries, but the area has always borne a distinctive aura of architectural and social fashionability. This section of Main Street was laid out as part of the Essex Turnpike in 1805. For the next two decades the area was only sparsely occupied by the new buildings, including two extant farmhouses and a boarding house for Academy and Seminary students. In 1825, the boarding house became Locke’s Tavern, heralding a period of more intense activity and growth.Between 1830 and 1852, Pike’s Soap Works were established on the northwest corner of Main and Morton Streets and several new buildings were erected in the Greek Revival mode, at least one designed by Jacob Chickering. The western side of Main Street was largely open land until the late 1880s when numerous Queen Anne and colonial Revival style buildings were built surrounding the earlier development here. The eastern side was more quickly and heavily developed by 1872 with a mixture of Federal, Greek Revival, Italianate and Queen Anne buildings. It retains that much of that look today. Locke Street (named after the first tavern keeper) was laid out as a public street in 1869 but it was not developed until the turn of the 20th century, circa 1890–1910, in the Colonial Revival and Shingle Style. Many of the structures are now multi–family residences. The architecture of the Main Street – Locke Street District includes a well developed range of Federal through Shingle Style buildings with a special emphasis on the latter in both number and quality. The increasing sophistication of the area residents is nicely reflected in their homes. In a remarkably short span of roadway one can locate some of Andover’s most prominent citizens of 1825–1925 and a microcosm of its architectural history. Uniform setback and spacing and attractive suburban landscaping also contribute to the high quality of this neighborhood. Between the two streets, Main Street is distinguished by its simple but refined forms, porches, secondary gables and careful attention to details. Locke Street is notable for its more unpredictable and inventive designs with their voluminous organic forms, more lavish porches and larger scale details. Amos Blanchard House, 97 Main Street (1819) was built by Amos Blanchard, a leading Andover businessman, church deacon and trustee of Abbot Academy. Now home of the Andover Historical Society, the elegant Federal style building is three stories high but only one room deep, with a hip roof, 2 story kitchen-ell, and pedimented center portico. Locke Tavern, 111 Main Street (1819) was built by Major Daniel Cummings as a boarding house for students of the Academy and Seminary. In 1825, proprietorship was transferred to James Locke, who moved down Main Street from the Mansion House. In 1840, the property was sold to Nathan W. Hazen, prominent lawyer and U.S. Representative, who lived her until his death in 1889. One of the town’s most important historical sites, the Tavern was a meeting spot for a variety of new enterprises: the organization of St. Mathew’s Masonic Lodge (1823), the first stock holders meeting of the Andover National Bank (1826), the organization of the Merrimack Mutual Fire Insurance Company (1828), the establishment of Abbot Academy (1828) and the decision to charter an Andover to Wilmington railroad. The large three story building is cubical in shape, with a hip roof and four narrow end chimneys; the center entrance with its simply pedimented portico is on the side. Amos Abbott House and Store, 106 and 112 Main Street (1832–33). Both structures were built for Amos Abbott, businessman, deacon, political figure and one of the community’s most respected citizens in the mid-19th century. Abbott lived at 106 and is said to have operated a dry goods, grocery, and drug store at 112. Both buildings have a side hall plan and fully pedimented gable ends. 106, a wood frame building, is more delicately articulated and has the distinctive window cornerblocks of its builder, Jacob Chickering. 112, believed also to be the work of Chickering, has a sturdy brick faÃ§ade. William S. Jenkins House, 116 Main Street (1852–58) was built by William Stuart Jenkins, a prominent carpenter and contractor, who later bought and remodeled 118, next door. This elegantly refined Italianate design is small and clean in detail, highlighted by its picturesque side entry porch and its arched faÃ§ade windows. Curtler–Handy House, 126 Main Street was first owned in 1884 by L.A. Cutler but by 1888 was in the possession of Mrs. Abby R. (John N.) Handy and Miss Elizabeth Handy. The property is distinguished historically as the site of a meeting in 1889 “to discuss the desirability of a Woman’s Club in Andover for social and literary advantages,” soon realized as the November Club. The house is Andover’s most outstanding Second Empire design extant. Its slate mansard roof, central pavilion, bracketed eaves, corner pilasters, corniced windows and rusticated walls combine in an extraordinarily impressive effect. Mary Ballard House, 1 Punchard Avenue (1885–88) was built for Miss Mary Ballard on property long known as Ballard land. In order to construct this modern building, Miss Ballard removed the old Greek Revival house (circa 1848) of Captain Joshua Ballard (farmer, timber trader and textile executive) now 104 Main Street. Originally facing Main Street, Miss Ballard’s house was moved backwards and turned to Punchard Avenue in the 1920s. The asymmetrical form is heavily decorated with porches, bay windows, pavilions, shingling, incised fascia and sunburst carvings on wall and porch gables. 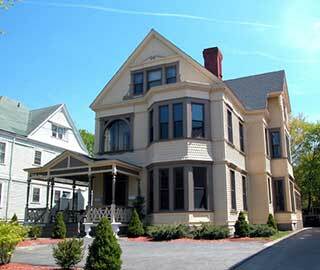 Exuberant but well controlled, the building is one of Andover’s best developed Queen Anne style designs. Shawsheen Village is located in the northern part of the town of Andover on a 600 acre tract straddling the Shawsheen River purchased in 1918 by William M. Wood, president and founder of the American Woolen Company. The planned community absorbed Frye Village a small community clustered around a saw, grist and fulling mill on the river established in 1718 by Samuel Frye. The American Woolen Company demolished the mills but retained most of the 25–30 houses that remained, moving those at the crossroads of the planned New Town, an area scheduled for redevelopment as the Village’s social and commercial center. The existing street system was retained, widened and expanded, keeping for the most part within the limits of Frye Village as it existed at the time of purchase. The proposed National Register District is bounded on the north by Interstate 495, by the Boston and Maine Railroad and a later residential neighborhood to the east, the flood plain and the playing fields developed as part of the Village plan to the south, and a later residential neighborhood, and expansion of the 1919–1923 neighborhood, to the west. a second residential and recreation area comprised of smaller yet well built and designed frame houses on somewhat smaller lots along streets put in by the American Woolen Company between the preexisting Balmoral and Burnham Streets, south of the Village center, and spilling over east of the railroad along Haverhill and Enmore Streets. This area was developed as residences for the middle level office workers. Shawsheen Village was conceived as a fully planned and self sustaining community for the executives and office workers of the American Woolen Company beginning construction in 1919 and continuing to 1924. The offices of the parent company were moved from Boston to Andover in 1923. Over two hundred residences were constructed in this period, along with the mill and supporting community facilities, including the Administration Building, Post Office, drug store and spa, an elementary, school, dormitory for single female office workers, a company restaurant, creamery, a large Merchant’s building, railroad station, (the mill workers were housed in nearby Lawrence and commuted by rail), two community garages (private off street parking within, the Village was prohibited), a power plant, brush mill and a laundry. The original plan also called for the construction of a host of recreational facilities, many of which exist today, a football field, running track/baseball diamond, swimming pool, tennis courts, a bowling green, and west of the Village, a championship 18 hole golf course. The west residential area between Riverina Road, William Street and Poor Street is predominantly an area of two and two and one-half story brick residences of distinction, designed in the Colonial Revival and Tudor Revival styles by Clifford Albright. Most of these eight to ten room structures are five bays wide, “T” plan with a gable roof parallel to the street, and are sited with a common setback on well landscaped and treed lots with ample side yards. Throughout the Village, all utilities are underground and there is no off-street parking provided. There is a scattering of frame houses, compatible in scale, siting, detailing and design with the brick residences, especially along Williams and Kenilworth Streets, west of North Main. Three unobtrusive two-story frame cottages on Poor Street and three two-family structures on North Main, two brick and one frame with deep setbacks alien to the site planning of this area, are later additions to the scene. Adding visual interest and a sense of time to the 1919–1923 development are four houses retained from the Frye Village period, two on Poor Street (both mid–19th century frame two story structures of good design and maintenance) and two straddling Kenilworth Street at North Main of equal quality. The east residential area consists of four sub-sections, each slightly different in character but similar in the use of materials, scale and siting. All residences in this area are frame, and most were built to the designs of John Adden, in the Colonial Revival style. The largest and the most cohesive section is located in the area that served as the “Town Farm” before the site was purchased in 1918. The area is bounded by Balmoral, Arundel, Burnham and York Streets, and is characterized by two story frame, clapboard and shingle residences with either gable or hipped roofs, the ridge lines of the gable roof parallel to the street. The c.1920 streets are arranged in a parallel row running north–south between Balmoral and Burnham Streets. The large trees here create an arbor effect of visual interest. Most of the houses are similar in design, from six to eight rooms, three bays and occasionally five bays wide, with common setbacks and side yards. Virtually all of the houses have projecting entrance porches, fieldstone foundations and excellent classically inspired detailing. Except for six later houses, all of the residences are from the 1919–1923 period. 7 Argyle Street is a large brick structure which may be part of the Town Farm that has been converted to apartment use and is incompatible in scale and materials to the frames single family residences. Maintenance throughout this area is of a consistently high level. The second sub-area is a row of two story (with three one and one–half story later cottages) frame structures with common setbacks on a gently curving street lined with trees. The houses have gable, hipped and cross gable roofs, with ridge lines both parallel and perpendicular to the street. Except for a cluster of six to eight houses at the curve in the street, which are Mid 20th Century, these houses probably date from the later part of the 1919–1923 development. The third sub-area is east of the railroad along Haverhill, Sterling and Carlisle Streets, an area of one and two story frame single family residences, with a row of later three frame multi–family two story hipped roof shingled structures at the beginning of Sterling Street. The east side of Sterling Street is later than the Shawsheen Village development, being one story frame residences of no distinction. The final section of this east residential area is along the west side of York Street, north of Haverhill. The single family residences are one and one and one-half story, frame and are similar to the houses in the Sterling-Carlisle area. Most or these houses date from the 1919–1923 period, but are smaller and less detailed than the remaining houses. More Information about the Shawsheen Village District can be found on the Shawsheen Renaissance Project’s web site. For nearly three centuries, West Parish Center has been the focus for the social and religious activities of that part of Andover lying west of the Shawsheen River. Historically an active church, subscribers built their own meetinghouse even before the parish was legally set off. West Parish Center originated partly from geographical convenience, but its historical and architectural cohesion is largely the result of a strong religious community. West Parish Center has had little in the way of industry or commerce to recommend it to history, unlike other areas in Andover. Until recently most West Parish families were farmers, although shoemakers were also found here in surprising abundance. 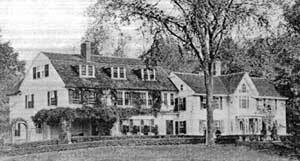 The Andover Grange, organized in 1890, was an important secular group, acting to promote the social, economic and political interests of farmers. The attendance of some 200 persons at one time attested to its popularity. The Grange built its first hall on Lowell Street near the present cemetery arch; this as moved across the street in 1908 and razed in 1972. West Parish Church, Reservation Road. The jewel of the West Parish Center is undoubtedly its church. 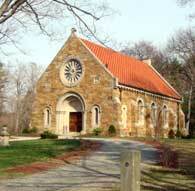 Dedicated in 1826, the elegant Federal style meeting house is the oldest house of worship standing in the Andovers. The building is constructed of local granite and originally had a square tower and three entry doors in the front. The interior was renovated in 1843, and the present spire and windows were added in 1863. The Spanish tile roof was probably added during William Wood’s era of improvements, circa 1908. A successful union of styles, the building is locally regarded as “a substantial and really beautiful edifice for a country parish.” A vestry built across Reservation Road in 1856 stood until 1928, when it was replaced by a new stone structure adjacent to the church. West Parish Cemetery, Lowell Street, Reservation Road and Cutler Road. The earliest graves here date from the 1700s when the burying ground was much smaller and opened onto Lowell Street. Manufacturer William Wood planned and financed several major improvements about 1908. These included rebuilding the circumference wall, addition a substantial amount of property, building three entrances, including the monumental arch facing the church and constructing a small Romanesque chapel with Tiffany windows and a Spanish Colonial Revival touches. Abbot Stanyan-Boyton House, 173 Lowell St. Built for Zebediah Abbot, shopkeeper, circa 1780. Purchased by Abbot’s son Zebediah, who was a charter member and deacon of the West Parish Church. His daughter Ann married Captain John Stanyan, another charter member of the West Parish Church. After several intermediate owners, the house was bought in 11868 by Benjamin Boynton, shoe manufacturer. 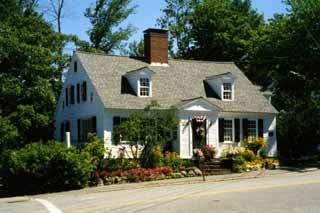 The clapboard house is a spacious 2½ stories with a gable roof, center entrance and side chimneys. The broad 5-bay faÃ§ade is articulated by large, elegantly detailed windows. Deacon Solomon Holt Farm, 111 Reservation Road. The house was built circa 1810 for Solomon Holt Sr., one of the most prominent men of this parish. Holt was president of the Westerly Meeting House Company, donated the lands necessary for building the meetinghouse and the first parsonage and served as a deacon for four years until his death in 1830. Solomon, Jr. succeeded him as a deacon, inherited the Hot Farm and was admired as “a hard working man of much care and responsibility.” The Holts’ 130 acre farm remained in the family until 1893. The 2½ story building has a gable roof and 5-bay faÃ§ade with center entrance; it is most notable architecturally for its finely detailed doorway which sports a dentilled pediment, double pilasters and paneled frieze. Abbot–Brown House, 161 Lowell Street. Built for Herman Abbot, (brother of Zebediah, above) circa 1780s. Herman Abbot kept a tavern here, where the stage coach from Lowell to Salem stopped. With the coming of the railroad in the 1830s, stage coaches disappeared and the house changed hands several times before 1842. From 1842 until 1934, the house remained in the family of Artemas Brown. 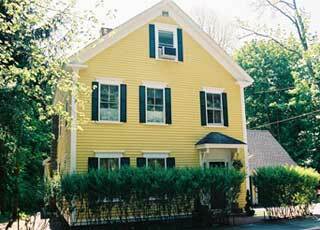 The clapboard house is 2½ stories with a broad gable roof, pedimented center entrance and side chimneys. The 5-bay faÃ§ade is distinguished by original 8/12 and 12/12 windows. Osgood Barnard House, 174 Lowell Street. Built circa 1810–1830 for Osgood Barnard “an old-fashioned shoemaker…in his neat little shop in the front yard of his comfortable dwelling house, seated on the bench…he receivers with simple dignity his visitors, and talk with more good sense on current topics and past events than some men talk who wear broadcloth and sit with dignitaries in seats of honor.” Ownership of the house remained in the Barnard family into the 1880s. The simple Federal style structure is 2 stories with a hip roof, plain 5-bay faÃ§ade and classical center doorway. Behind the house is a small 1½ story structure which is believed to be the original West Center School, built in 1848. Moses Parker House, 166 Lowell Street. Built in 1829 by and for Moses Parker, housewright, Caleb Richardson, a shoe manufacturer, bought the house in 1846 and it stayed in his family until 1875. A skillfully proportioned Federal style building, the house has 2 narrow stories under a hipped roof. Its 5-bay faÃ§ade is centered by a graceful doorway with leaded glass transom and side-lights and an Italianate portico. Reverend Samuel Jackson House, 197 Shawsheen Road. Built in 1830 for the first minister of the West Parish Church, Samuel Jackson, on land given by Solomon Holt expressly “in consideration that said Jackson has agreed to erect a dwelling house on the land.” Possibly designed by Jacob Chickering, the building was owned privately by the Reverends Jackson and Pierce. Chickering acted as an intermediary in transferring title to the Trustees of West Parish, who maintained it as a parsonage until 1926. This important transitional design has the traditional eaves-touching windows and center entrance, but boasts an unparalleled door frame of Greek fretwork. Phelps House, 183 Lowell Street. Built in 1846 for Herman Phelps, a farmer. Sold in 1869 to William Bailey, a shoe maker, whose family lived here until 1891. Later occupied by Frank Hardy and his son, who ran a store at the corner of Lowell and Beacon Streets and operated a brush factory in the building in back of the house. A rare example of stone construction, the Greek Revival cottage is built of coursed ashlar, 1½ stories high with granite window sills and lintels. The side hall plan includes a side-lighted doorway. A simple but vigorous design. Tuck House, 189 Lowell Street. Built circa 1863–69 for John Tuck 2nd, a farmer. Inherited by his son Moses Warren Tuck, a shoemaker, who lived here until 1907. A modest clapboard version of Greek Revival on the same plan as 183 Lowell Street, this well set house has a simple classical doorway and wide window lintels with cornice molding. Burtt House, 160 Lowell Street. Built between 1884 and 1889 for Edward W. Burtt, a market gardener. The vernacular Queen Anne cottage is 1½ stories with a gable roof perpendicular to the street. The design is distinguished by its side hall plan, fancifully sawn porch brackets and posts and faÃ§ade window cornices. Several ells connect the house with a large barn at the rear. C. A. Holt House, 202 Shawsheen Road. Built circa 1872–84 for C.A. Holt, thought to be Charles Abbey Holt, b. 1848, who is said to have gone to South America. Bought between 1884–1888 by G.F. Blake. An outstanding example of the Queen Anne/Eastlake style in Andover, this home exhibits all the eccentricity for which the period is know. The basic L-shape is dramatically broken by a diagonal corner pavilion, and flat planes are relieved by an overhanging 2nd story, decorative shingling, carving and stickwork. Elaborate gable screens and pliant treatment of porch details are perhaps the most extraordinary individual features. A rich and imaginatively conceived design, although awkwardly balanced. 181 Lowell Street, built circa 1920. A simple Bungalow home of 1½ stories. The structure’s wide gable roof encloses a full-length recessed porch. Wooden shingles are accented by a cobblestone chimney and porch parapet. The unpretentious building is most notable as the only example of its period in the district.